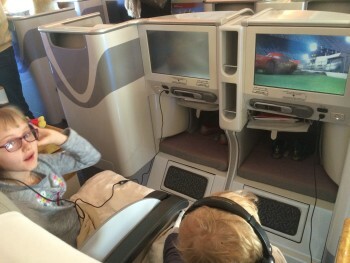 I found some photographs on my phone yesterday which I took on our flights down to Dubai at Easter, flying Emirates business class on an A380. 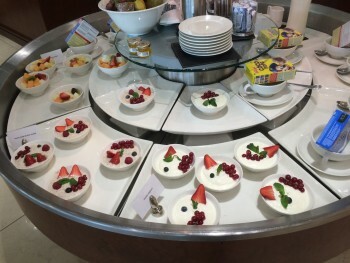 I have written about the Emirates lounge at Heathrow and the Emirates A380 experience before so I won’t cover it again in detail. Click through to the older articles if you want to know more. The official Emirates A380 business class website is here. Despite the photographs, I do not recommend taking a saxophone on-board ….. I didn’t take any pictures of the free chauffeur car that Emirates sent to collect us in London (and take us to our hotel in Dubai, and pick us up from our hotel, and take us home again when we landed in London.) Sorry about that! It did save us around £150 compared to taking four taxis. Business and First Class is on the upper deck. All seats face forward but are not aligned. In the middle block, one pair is by the aisle (see below) …. …. whilst the pairs in front and behind are directly next to each other with no gap. As every seat has direct aisle access, the seats direct next to the aisle have less legroom in order to leave space behind for the other passenger to get out without disturbing you. With kids this leads to an odd result – you put your kids in the middle pair so they can be next to each other, but it means the adults get ‘outer’ seats with less legroom! 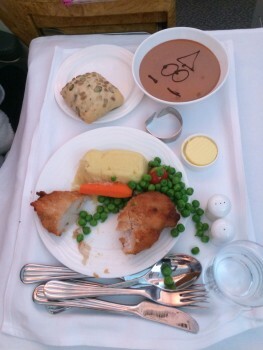 This is what children are given as a meal in business class – I have had far worse meals as an adult with certain airlines in business class! I made the mess cutting the chicken in half …. If you’ve got any questions about the Emirates A380 business class experience, ask them below and I will answer as best I can. You can also find out more on the Emirates A380 business class page on their site. 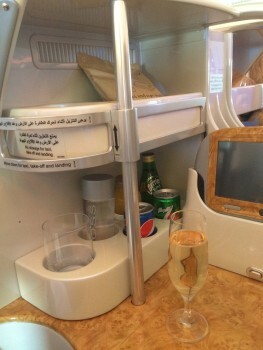 Nice, I’m trying economy in a Emirates a380 for 3 hrs tomorrow followed by F to Dubai, will be interesting to compare !! It’s a decent little flight. Make sure to get the $1 (US) WiFI service. It’s not that fast but allows you to read articles and message friends. Emirates have a cap of 500MB (if I remember correctly) usage but they state their charges are $0 per 100KB after. I was also informed by the cabin crew that the speed is dependant on the time of day due to the number of people using it, so don’t be too surprised if it’s a little slow but again, it’s $1. It is $1. But, like Qatar etc, they insist on plastic and not PayPal. Bu the time I remember this, my wallet is in my jacket which is in a wardrobe miles away at the back of the plane! Start using Paypal guys! PayPal probably charge then x% + 20p (or local equivalent) which on $1 is bonkers. Bet they’ve got almost no charge above the x% on their merchant acc. Charging just one US dollar for wifi access does seem slightly absurd… I guess it stops everyone jumping on it. As an IT worker who is familiar with legacy systems I’d put money on it having ben implemented as a payment system and the authorisation being tied in with that, and they just didn’t fancy remaking everything again. Just a guess but Im fairly confident in it! I flew this last year and thought it was a great product. 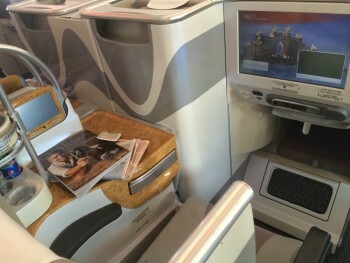 If you had a 12+ hour long journey, would you rather be on this or Etihad’s new business class? The Etihad 380 is a touch better and the crews are more polished. A380 not on many routes yet though. 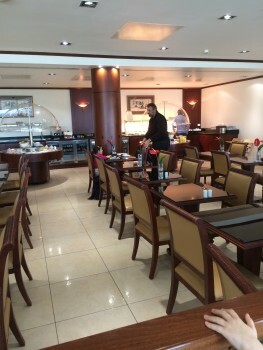 But your comment that the Emirates lounge ‘still looks like a 1980’s Holiday Inn’ did raise a laugh! I think this is the first time Raffles has exposed himself in person! Apart from the Instagram, LinkedIn and Google Plus pages, you mean?! Well, it all depends which historical sources you’re consulting. I think that is the first time I have ever seen you in person Rob , very apt that you have a bottle of champagne in hand. Keep up the great work. Love the website! 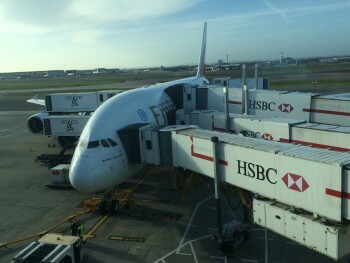 I’m taking my wife-to-be on honeymoon via Dubai in August on an A380 from London. Will definitely check out that $1 wifi (assuming its available to economy passengers). I just wanted to ask some advice – naturally being our honeymoon i’d like to make it a bit more special and although I couldn’t afford the cash difference between economy and business, I am sitting on 52,000 amex points (from my gold rewards card) – do you think this would buy me much? I’m fairly sure if I converted to skywards, this wouldn’t be enough for us to get a business upgrade, but what else might I be able to use these on that give good value? Hotels/Transfers are already booked. Thanks and keep up the interesting articles! Emirates lets you redeem for vouchers for days out in Dubai or retailer vouchers. However, the rates will be a very poor use of your Amex points. I’m not sure what the upgrade cost is to business in miles but it is substantial these days as the offer had got far too popular. 52,000 will definitely not cut it unfortunately. 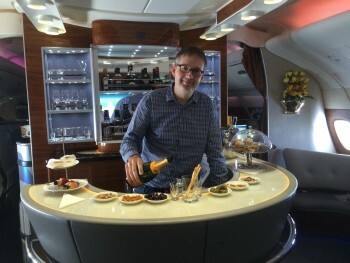 Not sure if Emirates lets you use miles to book a chauffeur transfer if you travel economy?